A few thoughts on the Arsenal 1-0 QPR league match… He’s Back!!! 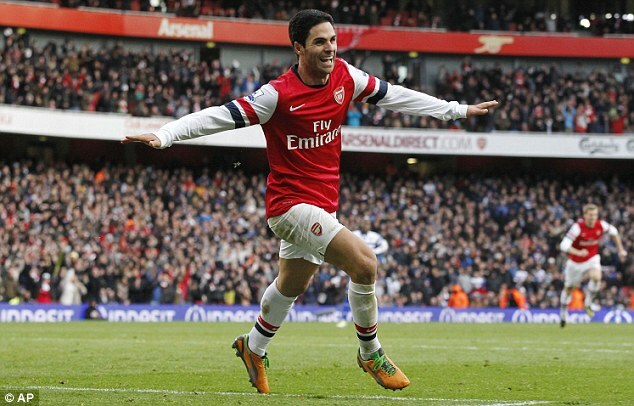 | "It's all about the Arsenal"
A few thoughts on the Arsenal 1-0 QPR league match… He’s Back!!! Saturday morning, wake up and wow”!!! Looks like it has been bloody cold overnight, it’s white outside. Now have to look for winter clothing to keep warm as the Emirates can get seriously cold. Sit down for pre-match ritual of Full English. This AGM shareholders and fans groups decide it’s time to act. Maybe the two defeats came at the right time as angry fans made it more uncomfortable for the board, I imagine had we beat Norwich and Schalke it would have been a little for the shareholders to get their point across. We’d be 4th in the table and almost certain to qualify for the knock-out stages of the Champions League, the club could have pointed this out had the meeting got a little feisty. One Person at the AGM and Fan Group member so annoyed, he jumped up, almost feel over trying to get to the microphone, and let Stan have it with both barrels… “You are legally obliged to meet with and talk with us” or words to that effect. I wonder who that could have been? Please call 010201020102 before 6pm tonight if you know the answer. Please do not call after this time or your comments will not be noted and you may still be charged. The growing feeling of disenchantment amongst fans is picked up by the media who in turn are given a stick to beat the club with. I checked and almost every paper having a Journalist to give their view of Arsenal’s problems. Now don’t get me wrong, the world is not a bed of roses at Arsenal and things could be better, but are thing really this bad. I reckon a lot of other clubs would look at us and think what are you lot bloody moaning about. So it’s off to Harlow-Scumhale, Arsenal Tube. Come out of Arsenal Tube, look a few stalls hoping to find a Poppy pin with Arsenal on it and finally get one at the fourth stall I checked out… Went over to ground and it is cold and buying a programme from a girl who was standing inside an empty programme box to keep feet warm (thinking inside the box)… It’s raining as I make my way with Son round the ground to entrance “P”. Go into ground. I like a coffee, but not the sort of stuff they serve inside the Emirates, but it’s cold so I give in and buy one, anything to keep warm. The cold makes it taste a bit better. Today something new… Some geezer introduces a couple of Arsenal Legends. First up was Ray Frank Stubbs who apparently has only missed six games in 23 years or something and that includes the last 13 years of away matches both domestic and European. Fair play to the bloke. Where does he get his money and time off from work from? The next Legend Charlie George, more my sort of Legend, though it could have been Steve Williams (little joke)… Mind you I could not understand a word of what he was saying. Then this geezer on the pitch says they are going to award the Arsenal player of the month to Santi Cazorla and by the time he had mentioned it, the young lad had already given the award to Santi who was making his way down the tunnel. The section of pre-match activity is going to need to sharpen up. I also noticed that Arsene did not come on the big screen to announce the teams, rather just given out by announcer. Looked to me as of this pre-match change was hastily done due to the AGM… Wonder why Arsene did not give out the team? Ramsey, Podolski (Gervinho 71), Giroud, Gervinho (Arshavin 81). Nice to see Jack Wilshere back in the side and you could sense the joy amongst the fans when they hear this. 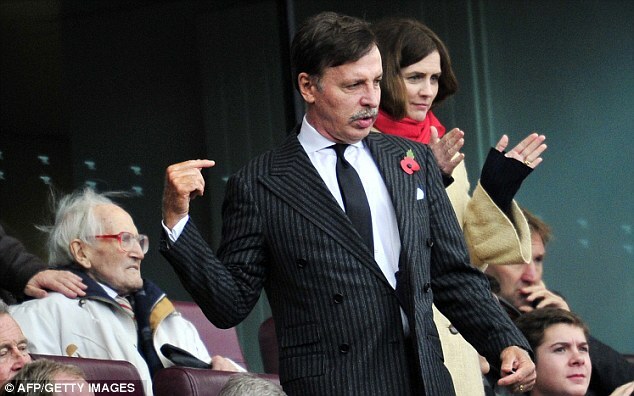 Also many Supporters favourite board member and owner of AFC was at the match, behind him was a Norman Duncan who was 100 two weeks ago and has been supporting the Arsenal for ninety-two years. I salute you mate. Now I was not expecting a classic… Games like never normally are after coming off a bad run and confidence is low, but three points taken by any means is first and foremost so a scrappy 1-0 win would be well received me. The ref Anthony Taylor blows his whistle for the game to get underway. Recent Arsenal performances are cleary affecting the team’s confidence. Though hold on!!! Podolski-Cazorla-Santos who crosses hard and low, Giroud gets a touch to the ball and Cesar manages to keep it out. Close!!! Podolski-Giroud-Wilshere-Sagna who crosses and Ramsey loops his header onto the bar… Close again. Giroud-Wilshere, who beats his man, plays a one-two with Santi takes two touches to set himself up and shoots. Cesar cannot hold the ball and unlike Mannone last week manages to parry the ball away enough and dive to stop Giroud from putting Arsenal 1-0 up. Tv5-Santos-TV5-Podolski-TV5-Giroud-Tv5-Santos-Giroud-Santos back to Giroud who shots from out wide and the ball is curling in and forces a good save from Cesar..
Not much else happened and the teams went in 0-0 at half-time.. That’s 238 mins without a goal now for Arsenal… For me on the other hand it was down to the concourse for another coffee as I was feeling brass Gareth Bales and in need of some warmth.. The second half is taking it’s time for both sides to get up to speed and the first thing of note is a booking for Granero for being a bit mouthy. Ramsey-TV5-Ramsey-Theo who crosses and Giroud tries to get in a header but it hits Mbia and falls kindly to out little Spanish magician, surely 1-0… With the ball right bang on the penalty spot, somehow Santi blazes the ball over the bar and sinks to his knees, he can’t believe it… I can’t believe it… You can’t believe it… Are we going to score again, that’s 258 mins without a goal..
Ramsey-Arteta -Cazorla on to Gervinho who runs into the area, can’t get his cross which is blocked and goes out for a corner. Gervinho is down and rolls off the pitch, looked like he had done his ankle. The Corner come in and goes right past everyone. TV5 chases the ball into the corner with Mbia a bit of argy bargy between them sees Mbia go down and Tv5 come out with the ball. However, as Tv5 shapes up, Mbia kicks out wildly at TV5 who goes down, Referee Taylor has no hesitation getting out his red card and that’s Mbia’s lot and his sprints off down the tunnel. QPR down to ten. Silly boy as he had already got the free-kick. 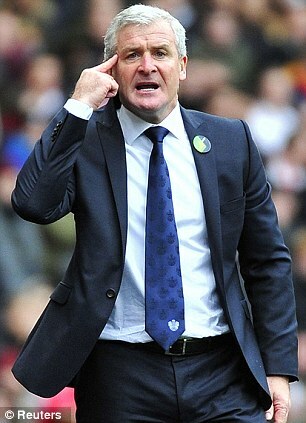 There are a few things that can make you smile in football and one is seeing Mark Hughes annoyed. Coooome on you reds!!!! Coooome on you reds!!!!….. Come on Arsenal… Come on Arsenal!!! Arshavin now come on to replace the replacement for Podolski Gervinho who did not last long. Arsenal corner taken by Arteta as it falls three QPR players try to clear or maybe I should say tried to score and almost concede and own-goal, but Cesar is there agin to keep it 0-0. another corner which comes to nothing. Arteta-Cazorla-Ramsey-Sagna-Santi-Ramsey-Arteta-Arshavin beat the defender and chips one up right into the area Giroud with a superb header is saved again by Cesar, the ball falls to Ramsey who toe-pokes it back goal wards and Arteta head towards goal and hit the bar, yet falls kindly back to him to put Arsenal 1-0 up!!! At bloody last… Get in there!!! 1-0 to the Arsenal… A touch of the offside about it… In fact he was offside… Arteta-Cazorla-Arteta-Cazorla-Arteta who crosses and it headed clear though only to Ramsey on the edge of the area who fires in a cracking low shot that it well saved by Cesar. Cazorla-Arteta-Ramsey to Cazorlawho comes inside and hits a curler that is going inside the right hand post when again Cesar makes a superb save and keeps the score down. Arsenal go to sleep and Taarabt picks Granero out with a worldy of a pass and somehow Granero manages to put the ball across the face of goal where he should really have made it 1-1. Then Mackie goes on a strong run and brushes first Arteta, the Santos and finally pushes the ball one side of TV5 and goes the other and thankfully Mannone is on hand to save the day with a good stop. Great run by Mackie. Mind you for those that think we may have got lucky and QPR deserved a draw, get real, if it was not for Cesar we would have won 5-1. Final whistle 1-0 and three points, three much-needed points. Sometimes it’s results like that and the way you have ground them out that can make the difference. Arsenal have not become a poor team overnight, they had a couple of poor results. All things considering, it was a reasonable match, frustrating at times on a bloody cold day. I sat there thinking why goalies tend to save their best matches for the Emirates. The defence kept a clean sheet, the fourth of the season, that’s six goals conceded in nine games and Arsenal now have the best goals against in the Premiership as since our game Chelsea conceded three against United. It was great to see Jack back and a lot of our play went through him. Jack very rarely wastes a ball and has a great eye for a long or short pass. The midfield with Cazorla, Arteta and jack is one to feel good about, three class players. With the defence looking solid and also having that bit of luck when needed all Arsenal need to start doing is scoring goals. So after the weekends games we rise from ninth to sixth. So now it’s surely a mixture of a side that will play Reading on Tuesday and then the big one against United next Saturday with an early kick off. hence after the Reading game I fully expect Weds, Spursday, Fri to be full on about the 2-8 defeat last season. Good article but it wasn’t that cold you big nancy boy!!! Arsene wenger should always put jack wilshe in first team in every match.